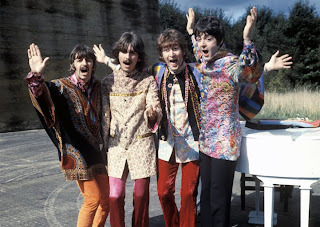 Amateurish, ad-libbed and often outright awful, the Beatles' 1967 TV special "Magical Mystery Tour" is the equivalent of an elaborate but excruciating home movie that happens to include some pretty good songs. Famous for being the fab four's biggest feet of clay fiasco, the nearly hour-long historical novelty arrives on DVD in restored form with extras that include a full-length commentary by Paul McCartney. Shot with no script and sort-of directed by McCartney, the surrealistic exercise in self-indulgence features the four Beatles taking a bizarre bus trip with a bunch of Fellini-esque eccentrics and extras. The band members also play a quartet of pointy-hatted wizards in a laboratory, and perform in costumes ranging from groovy psychedelic threads to natty white tuxedos. The slapdash, careless and badly improvised nature of the project is completely at odds with the Beatles reputation for meticulous studio craftsmanship when it came to making music. "Magical Mystery Tour" is full of enough shameless mugging, weak sight gags, go-nowhere setups and feeble fantasies to make "The Monkees" TV series look like the height of intellectual sophistication. Fortunately, the five songs sprinkled throughout (in addition to the title tune) are strong enough to survive the pre-MTV treatment they receive. The strongest is John Lennon's "I Am the Walrus," played by the fabs in hippie finery, furry coats and animal masks on a concrete airstrip. McCartney's "Fool on the Hill" puts him solo and spinning 'round on a mountaintop, while his "Your Mother Should Know" becomes a massive-staircase production number amid a sea of swishing ballroom gowns. George Harrison glooms his way through the druggy "Blue Jay Way" as an orange-suited beggar, sitting cross-legged on the ground and playing a chalk drawing of a keyboard. The instrumental "Flying," of all things, is the most visually interesting of the proto-videos. Its arial flyover shots of changing-color landscapes foreshadow the trippy "beyond the infinite" bit in "2001: A Space Odyssey." That's fitting, considering McCartney says the footage was made up of outtakes from "2001" director Stanley Kubrick's earlier "Dr. Strangelove." Dubious comedy bits include John Lennon as a demented waiter shoveling mounds of spaghetti, actor Victor Spinetti (who also appeared in the Beatles' "A Hard Days Night" and "Help!") barking unintelligible orders as a manic drill sergeant and an endless love-on-a-beach interlude between Ringo Starr's corpulent Aunt Jessie (Jessie Robins) and the creepily deadpan Buster Bloodvessel (Ivor Cutler). An enjoyable and unusually natural scene shows Lennon interacting with a smiling little girl who is sitting on his lap. It's also fun to see the Beatles join their fellow passengers in a rousing unexpected singalong of standards ranging from "I've Got a Lovely Bunch of Coconuts" to "When Irish Eyes Are Smiling." But while Starr seems to enjoy hamming things up and Lennon is cheerfully irreverent, McCartney often looks sleepily stoned and Harrison exudes unmistakable indifference. One of the strangest story tangents (and that's saying something) puts Lennon and Harrison in the audience watching a stripper (Jan Carson) who is accompanied by the Bonzo Dog Doo-Dah Band performing their Elvis Presley sendup "Death Cab for Cutie." The stripper's censored naughty bits turn up in one of the DVD's bonus features, which also include a 19-minute "making of" about the film, deleted scenes and different video edits of some Beatles songs. Two tracks by other artists that didn't make the final cut—Traffic's "Here We Go Round the Mulberry Bush" and actor Cutler's "I'm Going in a Field"—also appear. McCartney claims in his commentary that director Steven Spielberg told him "Magical Mystery Tour" was referenced in a college film course as "a different approach to filmmaking." It's different, all right.